If you have been here over the past 15 months or so, you just experienced what can be considered a 100-Year Event. You may not have known it, but you certainly witnessed it. For the first time in the past 93 years of official record keeping, our region has absorbed over 3 additional feet of rainfall, over and above any other measure in the same time period. The overall measurement for the 15 month period exceeds 8 ½ feet. In August of this year, places in Pennsylvania that received 4 inches of rain in a very short timeframe were catastrophically flooded. In our area, we can get 4 inches of rain in a single afternoon burst and our streets can be dry a few hours later. Thankfully, one of the most stringent State regulations is governed by the 5 State Water Management Districts. Northeast Florida is regulated by the St. Johns River Water Management District (SJRWMD). When it comes to adding any type of impervious surfacing as an expansion of existing development and infrastructure or as a result of any new development, the SJRWMD requires a comprehensive Management and Storage of Surface Waters (MSSW) permit. All of those man-made lakes you see within mixed-use areas, residential communities and along roadways are mandated drainage-retention basins. 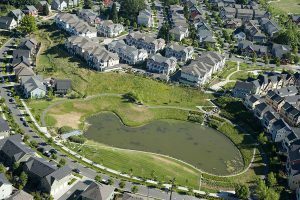 In the planning and development of a residential neighborhood, the land required to satisfy permit-required retention lakes can be as much as 20% of the developable land area of a project. In cases where proposed development would have to ultimately outfall to the drainageway of any designated Outstanding Florida Waters, tertiary retention basins to cleanse runoff and enhance natural percolation can require an additional 15% of the available developable land. 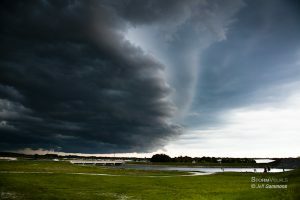 As a general rule of thumb, retention lakes are designed to accommodate both a 25 year storm event as well as a 100 year storm event with strict accounting for recovery times that do not exceed 48 to 72 hours. That means, any drainage system is engineered to return to normal water levels within a maximum of 3 days’ time after a 100 year measured rainfall event. For further protection, the land for all new development must be raised above the 100 year flood zone – either as a result of fill placement determined by a surveyed and engineered hydrologic drainage study or, short of such a study, a minimum of 3 feet above existing grade. Florida is fortunate to have an abundance of fresh water – both on the surface in rivers, streams and lakes and within its subsurface and deep aquifers. Extreme and prolonged rainfall events are always beneficial for recharging and replenishing the aquifers. 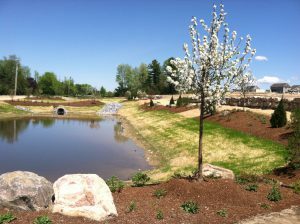 Additionally, it is comforting to know that in those events – the drainage runoff is handled through an environmentally-designed, highly-regulated and perennially-effective water management system.